This hokey pokey ice cream recipe deserves a special mention in the history of ice cream. 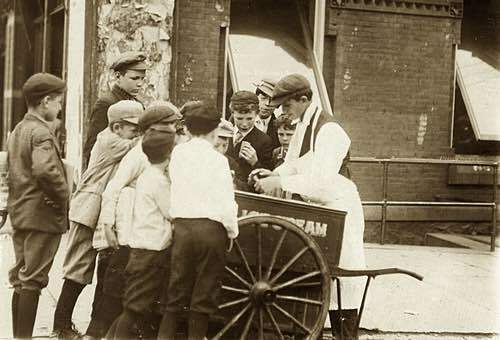 After the soldiers returned home from the American Civil War in 1865, it became difficult to find work in most American cities, and many unemployed immigrants living in those cities became ice cream vendors. As in London, England, they were called Hokey Pokey Men because they often shouted Ecco un poco in Italian which means, when loosely translated, "Here's a little piece." The term "hokey pokey" soon became identified with poor-quality ice cream, as it was sometimes made of questionable ingredients under very unsanitary conditions, and it was not uncommon for consumers to become ill after eating it. The way the frozen treat was served didn't help either, as you'll read. You might want to reduce the recipe quanities when making this at home. The original recipe makes over 1 gallon of ice cream. Take 2 oz of gelatine, dissolve in 1/2 pint of milk or water, then to 4 quarts of milk and 8 eggs slightly beaten add 1-1/2 lbs of sugar and the thin yellow rind of 2 lemons, and a pinch of salt; put the ingredients into a clean, bright basin, place on a moderate fire, and stir constantly till it begins to thicken; then remove quickly, and pour it into an earthen pan and continue to stir it till nearly cold, then add and stir in the dissolved gelatine; pour all into your freezer and freeze as for other ices. When frozen it may be put in small boxes about three inches long by two inches wide, or it may be wrapped in waxed paper and kept ready for sale in an ice cave (freezer). The office of the gelatine is to solidify the compound and assist its "keeping" qualities. Frozen hokey pokey was sold for a penny from pushcarts with an ice cave (freezer compartment), and the customers either licked it from a shallow glass known as a "penny lick" (as shown) or it was received in a small folded-paper box or hand-wrapped in a piece of waxed paper. When customers finished eating their ice cream from the glass penny lick, the "penny lickers" were returned to the vendor who simply gave them a brisk wipe with his ever present rag before refilling them for his next customers. The welcomed invention of the edible ice cream cone around 1900, helped to make sales of frozen ices much more hygienic. Are you curious what the hokey pokey frozen treat tasted like? Above, you'll find a "commercial" hokey pokey ice cream recipe from the 1890s for making hokey pokey, so you can capture the authentic taste of this historical ice cream. It's a real conversation piece when served to friends.